Marvin the sheep with the big appetite who made his first appearance in ‘Marvin Wanted More’ makes a second appearance in this picture book. Together with his friend Molly, Marvin happens upon a trees of big juicy apples. Despite the abundance of fruit that the tree is laden with, the very apple Marvin wants most lies tantalisingly out of reach. Exhausted by his efforts and the patience he has exerted, Marvin falls asleep only to awaken and find that the apple has fallen and Molly is eating it. Transformed and enraged by his anger at this, Marvin sets outon a rampage stamping on flowers, knocking over chicken sheds, frightening ducks and even biting a cows tail – this is one angry, even-toed ungulate. 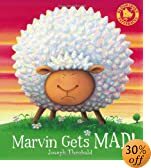 Theobold’s use of the docile sheep as the cantankerous protagonist heightens the humour of Marvin’s rage in this witty book which explores the folly of irrational desires leading those who suffer temper tantrums to feel somewhat sheepish. The frail, fickle nature of fame has been a recurring theme in Pete Johnson’s fiction, in ‘I’d Rather Be Famous’, astute comment was made as to the types of decision that are driven only by outward appearance, by what others think rather than what we ourselves actually feel. In ‘The Hero Game’, Charlie’s idolisation of his grandfather and his sheer determination to immortalise him are challenged by revelations as to his grandfather’s past, that he finds difficult to equate with his present perception of his uncle. ‘How to get Famous’ sees friends Tobey and Georgia desperately seeking the lime-light but learning the bitter consequences that follow failure and rejection. This is exacerbated further still by the crushing humiliation Tobey faces at an audition in which Georgia is successful. Pressures of personal hopes that are defeated alongside the achievement of friends’ achievement places friendship into a fragile context. In a surprise turn, however, Johnson achieves a twist that demonstrates incisively the spontaneous manner via which we affect and influence others through our actions as compared with the forced nature of acting and rehearsal. Tobey’s comic capers, retold through an approachable epistolary style, make for a humorous and affectionately told story that is elevated through the characteristic social comments and human observations that permeate this author’s work. 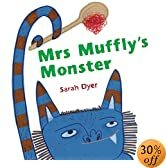 Generous helpings of monsters, mystery and the eponymous Mrs Muffly are baked together in this tasty treat of a picture book by monster maestro, Sarah Dyer. Warmth and affection belies the type of hearsay and hyperbolic assumption that lead to the conclusion that Mrs Muffly must be harbouring a monster at home! Alongside a deliciously different twist in the tale, the book introduces imaginative interpretation and concludes through the juxtaposition of these with a much more rational, though terrifically tempting explanation. A definite must read for those keen to develop ravenous readers. Personal aspirations and cultural expectation converge in this, Alexie Sherman’s first novel for young adults. Junior exists as an outsider, from the world as a Native American living on a reservation, to his peers as an individual whose thinking, behaviour, actions and reactions are slower than with many because of excess cerebral spinal fluid at birth. Through the course of the novel Junior battles against the prejudices of those around him, ultimately resulting in a decision that ostracises him from his people. The challenge then becomes proving himself, his worth and talent both intellectually and physically. Junior’s unique perspective on life results in the gradual acquisition of firm friendships and he battles towards a position whereby his individuality is recognised and acknowledged. At points painful, partly positive but always poignant, this an accomplished and astoundingly life-affirming novel. The near-universal base of Jiggy’s various mishaps and humiliations will make these familiar for many and thereby extending a sense of affinity towards him. Underlying the laugh-out-loud plot-lines, lies a caution as to the importance of privacy in adolescene, the ability to make our own mistakes, to fall prey to our doubts and emotions and ultimately to develop and grow because of that. Accordingly, as an adult reader, it is hard not to breathe a sigh of relief that Jiggy attains some form of reprieve by the end of novel and that his late childhood remains his own, not sold-off or commoditised.